It's National Adoption Week. That means that lots of people across the country work hard at trying to recruit more people to adopt some of the many children that are in care. 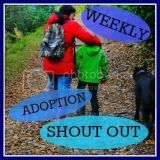 One of the common themes in trying to do this is myth-busting and over on The Adoption Social, we have a number of guest bloggers this week showing how they've overcome some of the things that could be seen as barriers, and indeed - myth busting! Adopting our son was the easy bit. Yes it was a long process from initial enquiry, through home study, to approval and then matching. But every. single. bit. of that process was absolutely necessary and vital to ensure that we were the right people to become adoptive parents and so that we could be matched with the right child. It was an interesting and reflective process during which the NC and I learnt lots about ourselves and each other. We never saw it as jumping through hoops, we never saw it as invasive - just necessary for us to proceed on the journey towards our ultimate goal of building a family. And despite it taking a while to get there, the speed really wasn't important to us - it's more of an issue to the children who wait in care longer than they should. Parenting our son has been the hard bit. It's challenging, but that means that it's rewarding too. It's tiring, but that means I enjoy the rest more. There is violence, which makes the affection so much sweeter. It's frustrating, but such an achievement when things go well. There is often shouting, which makes the peace of term time twice as peaceful. There is much guess work, but it feels like angels are singing, awooga horns are blaring, and fireworks are popping overhead when you guess right! Ultimately there is a family. I am mum to a sweet, kind, caring, chatty, gangly, excitable, bouncy, vibrant, inquisitive little man. I'm lucky enough to be mum to a kind, loving, cuddly, energetic, all singing, all dancing Dollop too. And despite all the struggles, I wouldn't be without either of them. I'm linking this post up to the #WASO special for National Adoption Week. I think lots of people are put off by what they perceive to be the difficult approval process...if only they knew that it was the easiest part! Your words ring true. Well said.